We are honored to be named once again to Eater’s “38 Essential Los Angeles Restaurants” list for Winter 2019. It is highly prestigious and all of us at Langer’s Delicatessen are grateful for the award. Thank you, Eater! There is no more iconic single sandwich in Los Angeles (and no better pastrami sandwich in America) than the #19 at Langer’s. It’s the absolute pinnacle of a Jewish deli staple, complete with mile-high stacks of pastrami, Swiss cheese, and coleslaw on rye. We are proud and thrilled to have been named once again to Eater’s “38 Essential Los Angeles Restaurants” list for Fall 2018. We are thrilled and honored to be included in Eater’s recent “California’s 38 Best Restaurants” article by Bill Addison. 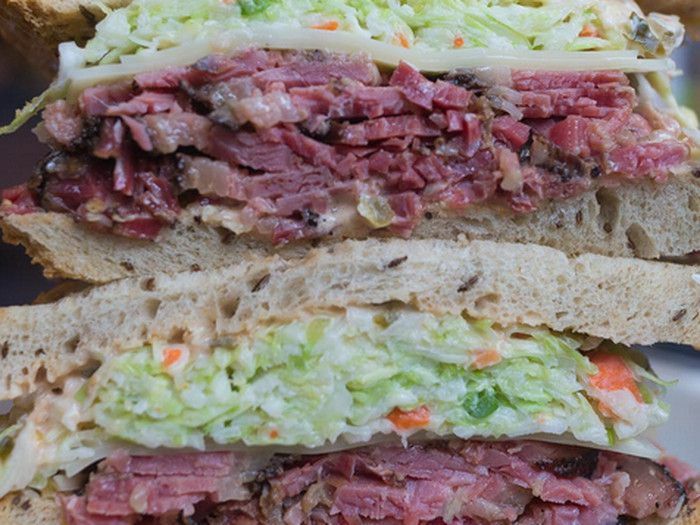 WHAT: The legendary West Coast-style Jewish deli that rivals America’s best. WHY: There is no denying the allure of Langer’s, the daytime-only Jewish deli in historic Westlake. The family-run restaurant has held down the same corner for more than 70 years, seating hungry locals and tourists by the hundreds in the wood-paneled dining room while waitstaff flit past in white shirts and, for the men, bow ties. Nearly every table gets at least one iconic #19, the house-made pastrami and coleslaw behemoth that is on par with (or better than) anything New York City has ever produced. We are proud and grateful to be named once again to Eater’s 38 Essential Los Angeles Restaurants (Winter 2017-18). Thank you, Eater LA and thank you to our valued customers who have supported us into this, our 71st year of operation at 7th and Alvarado. Yes, the #19 pastrami sandwich is an amazing sandwich, but the pure pastrami on house-based rye is simplicity at its best. There’s a reason why people make pilgrimages to try their pastrami and even corned beef: there is no better version anywhere in town, and perhaps even in the country. Pro tip: try the #54, a blend of both the pastrami and corned beef in one sandwich. 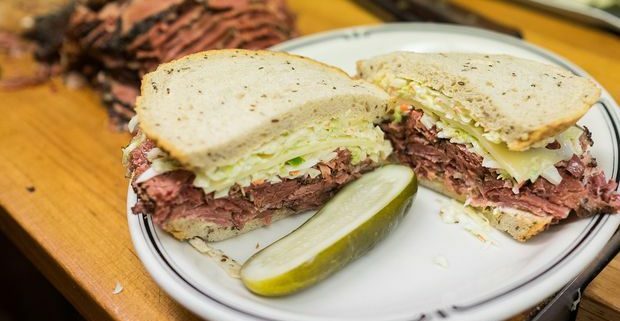 And don’t skip the rest of the classic Jewish deli menu — it’s all very well executed in one of the best day-time dining rooms in town.